Jammu & Kashmir Bank PO Examination which was scheduled on 21st February 2019 and J&K Banking Associates examination was scheduled on 22nd, 23rd, and 24th Feb 2019. But due to some official problems it has rescheduled on 22nd April 2019 to 26th April 2019. Admit card is available now for J&K Bank PO and J&K Banking Associates. 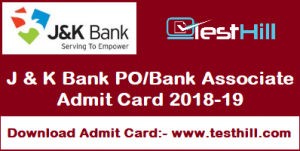 Candidates can download Jammu & Kashmir bank PO Admit Card till 22nd April and Bank Associated Admit Card till 26th April 2019. You can download it from below available table. Jammu & Kashmir Bank has already called the desirable candidates to fill up the applications for Probationary Officer and Banking Associates. There are 1450 vacant seats for the respected post. A huge rush has applied for Jammu & Kashmir PO Recruitment 2018-19. Now, they all have to appear in the written examination and another process to get selected for Jammu & Kashmir PO and Banking Associates. The J & K PO Prelim Examination is to be scheduled on 21st February 2019.